Soups are a staple in my household we all love them especially when the weather is wet and grim. 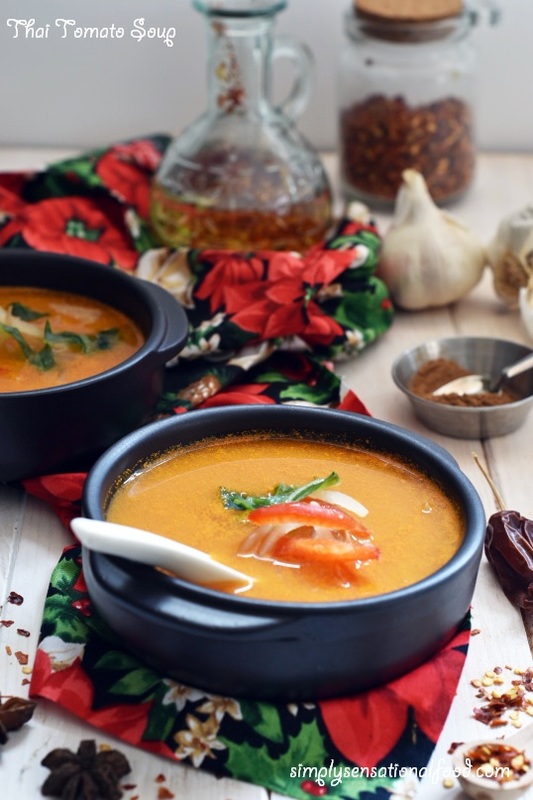 This Thai tomato soup is so simple to make and strangely the recipe works best with overripe tomatoes that are usually too soft for salads. Adding the Thai flavours just converts the humble tomato soup and makes it A class!! 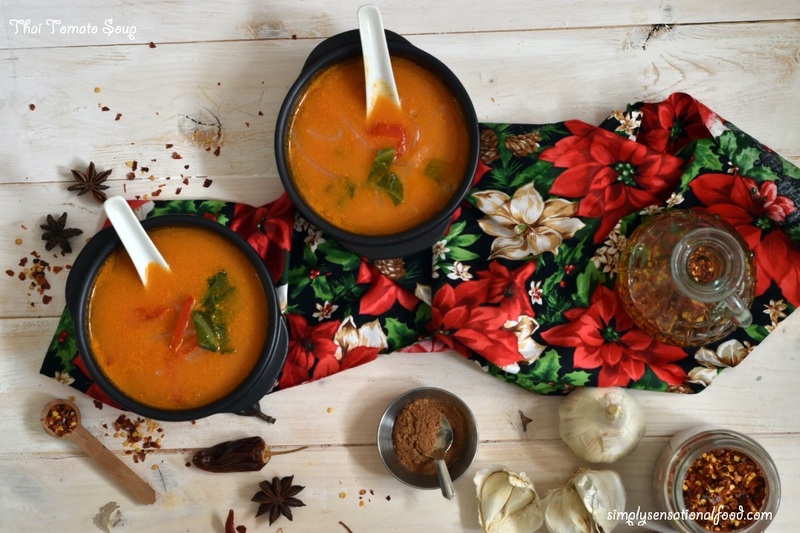 Simple tomato soup packed with Thai flavours of lemongrass and Chinese five spice. 240 g ripe tomatoes roughly diced. 1 inch piece lemon grass finely chopped. 1. In a large pan add the oil, when its hot add the chopped onions, garlic and leeks and saute them for 3-4 minutes until translucent. 2. Add the carrots and chopped tomatoes and lemon grass to the pan and the water and bring the soup to a simmer. 3. Cook the soup for 10 minutes. 4. Transfer the soup to the Optimum 9400 blender and blend until smooth. 5. Strain the soup into the pan and discard any residue left in the strainer. 6. Add the salt, pepper, chilli flakes and Chinese five spice and bring the soup to a slow boil. Turn off the heat and add the bean sprouts. 7. Ladle soup into serving bowls and enjoy with crusty bread. I used my tried and trusted Optimum 9400 to blend my soup. The blender is so versatile and powerful that it grinds, pulses, makes ice cream, soups and amazing smoothies and nut butters too. It is easy to clean and maintain too. The Optimum 9400 2nd generation is currently on offer for £289. Froothie currently have a blender sale on all their blenders . These include the Optimum G2.1 their newest & most advanced optimum blender which is reduced from £559.00 to £339 and Optimum air vacuum blender is reduced from £499 to £339 . This is the perfect time to buy in time for Christmas. Froothie also offer 0% finance on products over £299 and only require a 10% deposit. That's not all, the fab people at Froothie are offering you lovely readers FREE DELIVERY too (for a limited time). Just use this code 1572 FREE AMBASSADOR DELIVERY in the comments box when making your purchase, the delivery charge will then be refunded. Froothie are also offering a free gift worth £179 if you buy two blenders. All the blenders come with 30 day return option so you can buy and try and return f you are not satisfied with the purchase. If you enjoy visiting simplyfood and would like to receive regular updates and a monthly newsletter straight into your inbox please sign up by email. You will find the email and newsletter signup right at the top under my photo in the side bar. Yummy! Looks so good and all of your photos make it look even better. Mmm this sounds lovely! I think this is officially the first recipe I've ever seen 1/3 of a tsp as a measure though - do you have measuring spoons in that size? Your soup looks perfect for winter. Love this healthy thai soup recipe with bean sprouts. A simple soup but looks so warm and inviting. Can just imagine how the lemongrass flavored soup would taste. Tomato soup is one of my favorite foods, and this looks like a unique twist on tomato soup. Can't wait to try it! This looks delicious! I think I just might try it out for our annual holiday feast. yummm! i have been in a soup mood. My question is what are the spices that determine a food to be "Thai". I love a good all American tomato soup and grilled cheese but I’m digging the Thai twist to it. I need to try it! You reckon it’s similar to the traditional Tom Yam soup? This soup looks perfect for the winter! I love having soup and will definatly have to try out making this recipe! Love the recipe, great that it does not use any creamy base but water instead, Makes it healthier. This Thai tomato soup sounds so unique. I know my parents would love it. Maybe a little too spicy for me. i am not much into tomato soup but you made this really interesting for me to try at home. Definitely the blender makes the difference. I've got an immersion blender and considering buying one like the une you use, instead. I'm not sure I can find the Chinese five spices here in Italy, maybe online? This does look healthy and would love to give it a try someday. I love a home made tomato soup especially when it is so cold outside! I love soup during cold weather so this is perfect. This seems easy to make so I might try this on Christmas. Thank you for sharing! Oh I love tomato soup! Paired it with toast bread and its perfect! I love homemade tomato soup! This is the kind of meal I could eat all winter long! I like that it has lemongrass. I don't think I've ever actually had that in a recipe. My boyfriend always insists on adding cinnamon to my tomato soup when I make it. I imagine chinese five spice is pretty similar! I'll have to try it. I always use cinnamon when I make my tomato soup, my boyfriend loves it that way. I'll have to try the chinese five spice instead sometime. Looks delicious! Wow.. I must try this Chinese version of tomato soup.